Did you know that Acrobat XI has an Action Wizard? That’s right, if you look under the Tools Panel on the right, it has its own section. Here you’ll find several pre-made actions for automating your workflow – but that’s not all. Acrobat XI allows you to create your own custom Adobe Acrobat actions, simply by choosing the steps you want to automate. When you’re building your action, you have the controls available to set all the parameters automatically for each step, or to allow interaction. The action will pause and you can choose options and settings while the action is running. Actions can be a productive way to handle repetitive tasks, but that’s not all. You can use actions to ensure that you’re following a consistent set of steps each time you perform a critical task with your PDF documents. This can help create uniformity and consistency over a body of work. The actions help make sure you don’t leave out any important tasks. 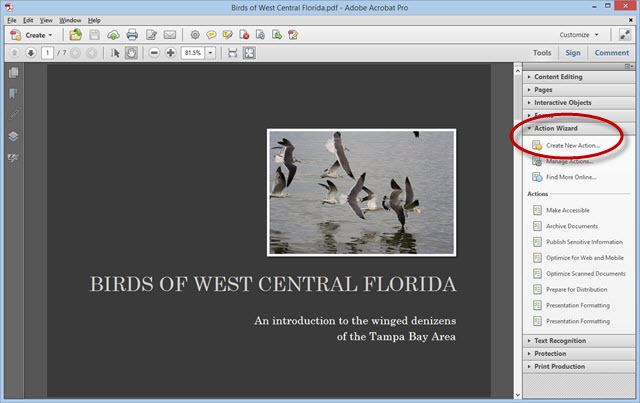 But, it’s easy to create your own custom Adobe Acrobat actions, as you’ll see in the video below. This video is part of my course in Advanced Adobe Acrobat XI, available at Infinite Skills. This entry was posted in Acrobat, Creative Cloud, Tutorial and tagged Acrobat, Actions.